Definition at line 84 of file CNodeK.h. Definition at line 31 of file CNodeK.cpp. References CONSTRUCTOR_TRACE, mConstant, mIndex, mLeft, mOldIndex, mRight, mSubtype, mType, and N_NOP. Definition at line 43 of file CNodeK.cpp. References CONSTRUCTOR_TRACE, mConstant, mIndex, mLeft, mName, mOldIndex, mRight, mSubtype, and mType. Definition at line 56 of file CNodeK.cpp. References CONSTRUCTOR_TRACE, mConstant, mIndex, mLeft, mOldIndex, mRight, mSubtype, and mType. Definition at line 68 of file CNodeK.cpp. References CONSTRUCTOR_TRACE, mConstant, mIndex, mLeft, mName, mOldIndex, mRight, mSubtype, mType, N_IDENTIFIER, and N_NOP. Definition at line 81 of file CNodeK.cpp. References CONSTRUCTOR_TRACE, mConstant, mIndex, mLeft, mOldIndex, mRight, mSubtype, mType, N_NOP, and N_NUMBER. Definition at line 96 of file CNodeK.cpp. Definition at line 93 of file CNodeK.cpp. Definition at line 375 of file CNodeK.cpp. Returns a string that contains the equation defined from this node downwards. 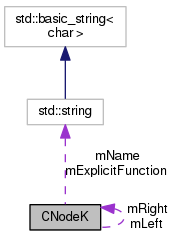 The function contains explicit names of node identifiers, rather than the abstract symbol. Definition at line 380 of file CNodeK.cpp. Definition at line 340 of file CNodeK.cpp. Definition at line 356 of file CNodeK.cpp. References C_INT, isIdentifier(), and mName. Definition at line 348 of file CNodeK.cpp. Definition at line 335 of file CNodeK.cpp. Definition at line 330 of file CNodeK.cpp. Definition at line 450 of file CNodeK.cpp. References mType, N_IDENTIFIER, N_KCONSTANT, N_MODIFIER, N_OBJECT, N_PRODUCT, N_SUBSTRATE, and N_VOLUME. Definition at line 435 of file CNodeK.cpp. Definition at line 445 of file CNodeK.cpp. Definition at line 467 of file CNodeK.cpp. Definition at line 440 of file CNodeK.cpp. Definition at line 472 of file CNodeK.cpp. References mSubtype, mType, N_FUNCTION, N_IDENTIFIER, N_NUMBER, and N_OBJECT. Definition at line 101 of file CNodeK.cpp. References C_INT32, CReadConfig::getVariable(), mConstant, mIndex, mName, mSubtype, mType, N_IDENTIFIER, N_KCONSTANT, N_MODIFIER, N_NUMBER, N_PRODUCT, N_SUBSTRATE, and CReadConfig::SEARCH. Definition at line 504 of file CNodeK.cpp. Definition at line 420 of file CNodeK.cpp. Definition at line 425 of file CNodeK.cpp. Definition at line 395 of file CNodeK.cpp. Definition at line 400 of file CNodeK.cpp. Definition at line 415 of file CNodeK.cpp. Definition at line 430 of file CNodeK.cpp. Definition at line 405 of file CNodeK.cpp. Definition at line 410 of file CNodeK.cpp. Definition at line 390 of file CNodeK.cpp. Definition at line 385 of file CNodeK.cpp. WHAT IS THIS FOR??? PLEASE ADD COMMENT! Definition at line 137 of file CNodeK.h. Definition at line 117 of file CNodeK.h. Referenced by CNodeK(), getConstant(), load(), and setConstant(). Definition at line 142 of file CNodeK.h. Definition at line 127 of file CNodeK.h. Referenced by CNodeK(), getIndex(), load(), and setIndex(). Definition at line 107 of file CNodeK.h. Referenced by CNodeK(), getLeft(), isLeftValid(), and setLeft(). Definition at line 122 of file CNodeK.h. Referenced by CNodeK(), getName(), load(), and setName(). Definition at line 132 of file CNodeK.h. Referenced by CNodeK(), and setOldIndex(). Definition at line 112 of file CNodeK.h. Referenced by CNodeK(), getRight(), isRightValid(), and setRight(). Definition at line 102 of file CNodeK.h. Referenced by CNodeK(), getSubtype(), leftPrecedence(), load(), rightPrecedence(), and setSubtype(). Definition at line 92 of file CNodeK.h. Referenced by CNodeK(), getType(), isIdentifier(), isNumber(), isOperator(), leftPrecedence(), load(), rightPrecedence(), and setType().